Beautiful Lake-View Home w/2 Separate Living Spaces! Enjoy a bird’s eye view of the lake from your spacious deck. With its western facing view, enjoy fabulous sunsets of pink, gold and orange right from the living room as well as the master bedroom. Take in the sunrise breaking over the trees with your toast and coffee, or perhaps have your lunches out on the covered deck as you catch the gentle breezes and soft bird songs. The spacious main house is on the upper level (must climb interior stairs). The floor plan of this beautiful 2 bedroom 1 ½ bath vacation home sleeps up to 6 people on the upper level and 6 people on the lower level (no stairs). The additional modern and spacious Garden Suite with 1½ baths & full kitchen adds the flexibility of having up to 6 people sleep downstairs. Top it off with a large patio to wind down the day and relax! Each unit has all of the amenities you’ll need for pleasure, comfort and a fabulous vacation. The Deerhart Lake House is located 5 minutes south of Florence overlooking Siltcoos Lake. Nestled at the base of a majestic cedar forest overlooking Siltcoos Lake is the fabulous Deerhart Lake House! This wonderful vacation rental has everything you’ll need for your family or group of 8 to 12. 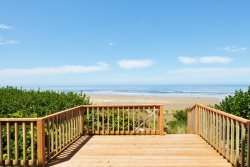 Bring your water craft and enjoy that special vacation that can only be found on the Florence Oregon coast. Linear gravel Driveway with slight incline. Will park 3 vehicles, Sorry No Trailers!! Please be considerate of your neighbors as this is a shared driveway.